Squids Odyssey Switch available today! That’s it, after our all-boss fighter Furi, it’s our first game, the tactical underwater RPG Squids Odyssey that is available on Nintendo Switch. We’re feeling a bit sentimental about bringing our very first game to the Switch, and a bit proud because we think the Switch is the best version so far. We’ve also set up discounts for the launch and for all players who own some of our games. Discounts: 20% off as a launch discount for two weeks (11,99 € / $) + players who own Furi get 15% off on Squids Odyssey and players who own Squids Odyssey get 15% off on Furi too. More info on the game below. Squids Odyssey is a unique proposition: a tactical turn-based RPG with a twist of fling mechanism. The adventure takes place under the sea. A murky black ooze is seeping into the water, turning once friendly crustaceans into cranky monsters. With their realm under siege, a scrappy shoal of Squid heroes has no choice but to fight back. As they engage in battles against their oily enemies, these unlikely heroes’ squishy bodies serve as their weapons: simply stretch a Squid’s tentacles, aim, then let go to shoot it across the battlefield. Build your party from 15 Squids in 4 classes: shooters, scouts, troopers, and healers. Engage in 90+ missions for more than 15 hours of gameplay, plus an expert Pro Mode, with completely redesigned missions, that doubles the game length. Flexible controls: the game is playable with either the touch screen, the joysticks and buttons or the Pro Controller. Game available in English, French, German, Italian, Spanish and Russian. 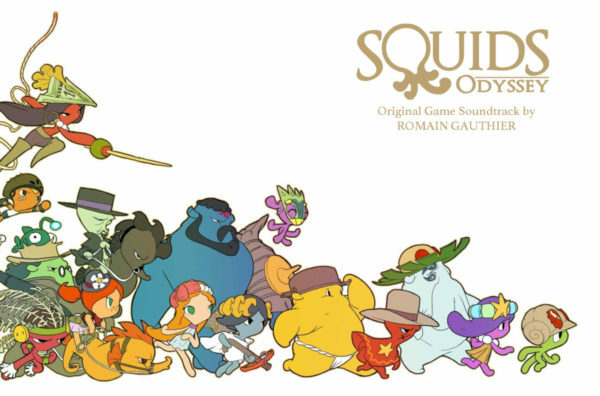 Also composer Romain Gauthier has remixed the acclaimed soundtrack and added all music ever made for Squids, some tracks unpublished until now. It’s for free on Bandcamp here. « We didn’t know it but Squids Odyssey was actually designed for the Switch!